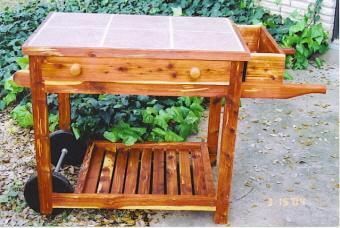 The barbeque accessory table can be used on the patio or indoors. It features a tile top, a large drawer for barbeque accessories and a towel bar. It also has a condiment section on the end. It is made of cedar and has an oil finish. It also has one shelf.